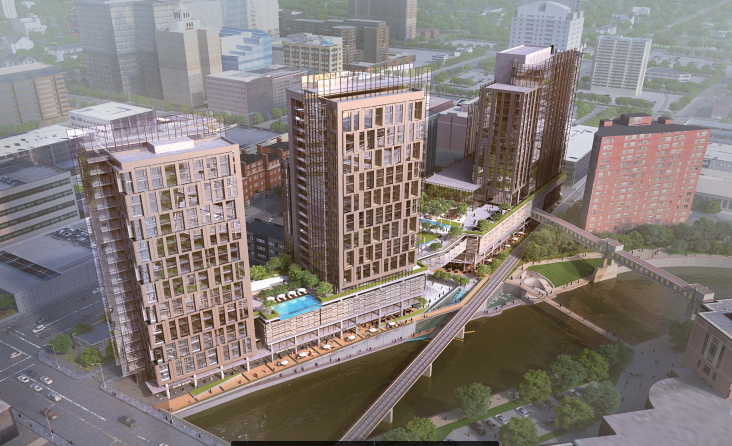 Some new renderings and information have been released regarding the project by Bloom Capital along the Zumbro River in downtown Rochester. Should be going to the city council soon, the way Wojcik made it sound. I still wish it didn't have that overhanging parking bridge over "historic" third. Overall, quite a get for the city, if it goes through. Why not? There was already another overhanging parking ramp built over "historic third" less than a decade ago, with state dollars to boot! It's the Rochester way! Yeah, but, Dooley's makes up for it ... right? I like this updated design a lot better than the original. A lot more glass and less concrete. Hope this gets going. Agreed. 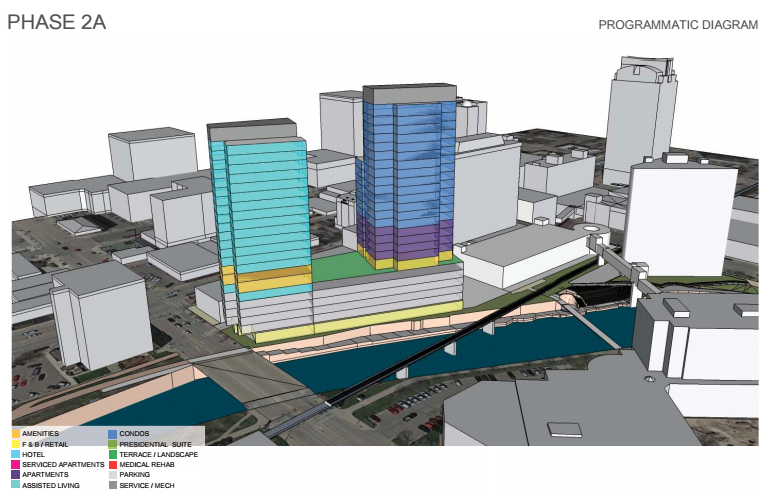 That section by the riverfront could really use some revitalization. I'm pleased to see that they've included a variety of hotel, apartments, condos, assisted living, and even a rehab center. Now someone just needs to demolish and replace that Holiday Inn building adjacent to this project. I don't think that Holiday Inn is going anywhere. The top 4 or 5 floors are condos. Would have to buy all those out first. This will transform downtown. Perhaps even drawing more big development. Have passed this on to a couple of single friends who work at Mayo. Both are interested in purchasing units. Both live out near the edge of town and commute each day. They are excited about this. This should fill up quick as they have a huge target market working blocks away. Apparently the apartments at 501 on 1st (by the Food Co-Op) are selling fast, all of the lofts have been leased. I have no doubt that this project will attract a lot of Mayo employees too. It's fantastic to see this apartment and condo boom downtown! 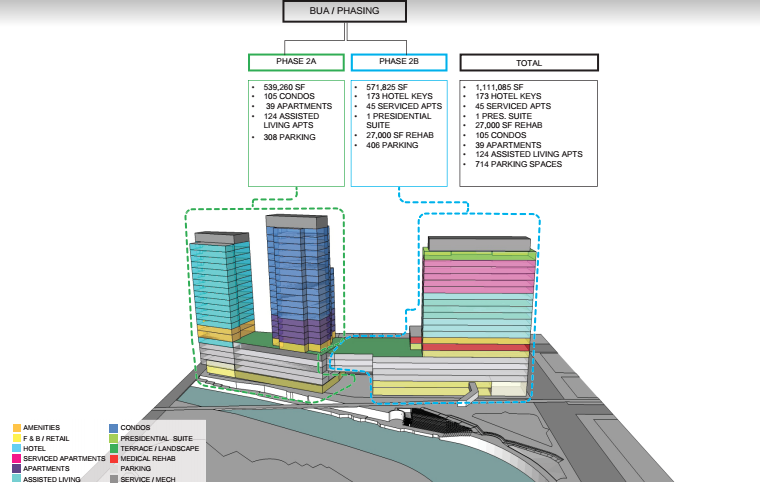 Bloom has changed some details regarding their proposed development in downtown Rochester. According to the Post-Bulletin, Bloom and the city could reach a final development agreement within the coming weeks and construction may start this year still pending the City Council's permission. Sadly there aren't any updated renderings or pictures of the project. "Bloom has returned back to the plans of having two towers instead of three," said Mark Dickson, CEO Rochester's Oxford Management. "The original plan (in 2015) had two towers, but then they decided to add a senior tower. After the crunching the numbers, it was decided to fold those senior apartments into the hotel and go back to two towers." This new plan is slightly smaller than the previous version. The current plan includes 896,936 gross square feet of space versus the 1 million gross square feet of the 2016, three tower proposal. 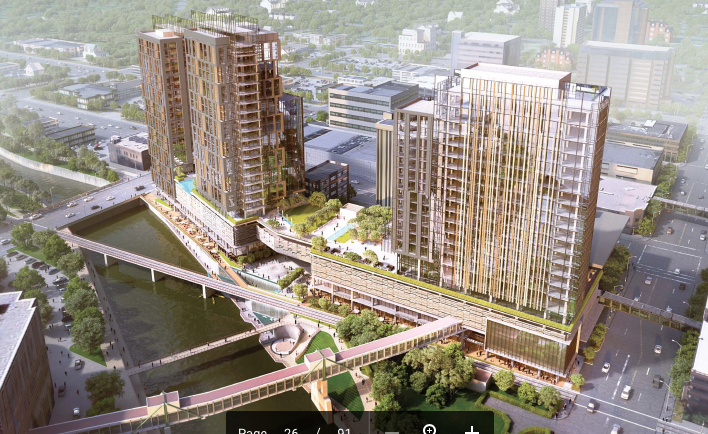 The current proposal includes 166 condo apartments, 126 senior living units and 160 hotel rooms. Plans show that the condo apartments will all be housed in the south tower. The senior units are proposed to be located above the hotel rooms in the north tower. This is the best image I could find. Looks like 22 and 26 story towers. Still impressive and glad to hear it's continuing to move closer to groundbreaking. Somehow now the overall look shifted, don't you think? It looks like parking ramps crammed up to the river with a couple towers stuck on top. Still good for the city and downtown. I agree about the projects look completely changing with the lack of the third tower. I think that the third tower brought a balance between the parking podiums and the high rises above. According to Finance & Commerce the south tower will be 23 stories tall and the north tower will be 24 stories tall. The city-owned land appears to be spread over five parcels, according to Olmsted County property records. Collectively, they are valued at about $4.1 million. Most of the parcels have seen a dramatic increase in value since 2015. The value of one parcel just above Third Street Southeast, for instance, zoomed from $91,500 in 2015-2016 to $619,900 in 2016-2017. It's expected that the project will go before the DMC board this May and then the City Council. They still hope to break ground this year. That's a good point about the design change imbalancing the project. 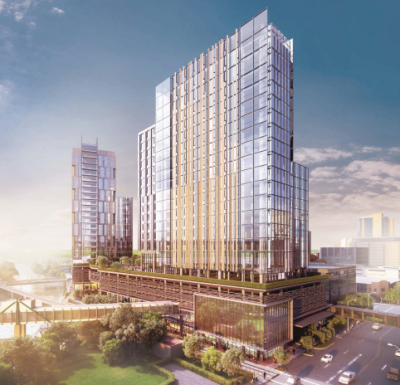 One thing I like about the new design is the removal of the connection over 3rd street SE with that green space moved to where the southernmost tower would have been. Now there is an uninterrupted view of the riverfront down the street without a parking ramp obstructing the view like the one over center street. I'm not sure whether or not Finance & Commerce has the correct height or the image from KROC. But that's a minor point and we'll know soon enough once the development proposal is filed. I'm surprised the value of the parcels has gone up that much in just this past year, as I would have thought most of the increase would have come around 2013-2014 when DMC was announced. I wish the condo tower would go about 5 stories higher. Not only because there needs to be some variation in height, but because condos should sell very easily in downtown Rochester. There are a ton of younger medical professionals with plenty of money that want to live downtown. And a lot of people that come from the East Coast that are used to living downtown. Really hope this building sells fast to send a message to other developers. A conditional use permit was filed last week. The project will go before Planning and Zoning and City Council in February and March. Can't find anything on the city website for it yet, but glad to hear this will mean a new tallest for Rochester! The renderings shown in the video are all outdated, so hopefully we'll get some new ones soon. This will be fun to follow. I hope the street presence is high quality and not blocks worth of stone and concrete, and instead have tons of doors.